Well, the best way to have the perfect granola is to make your own! And all it takes is for you is to decide what to put inside! You can check out my general recipe here or if you like it, follow this one. Don’t you like one of the ingredients? Just switch it with something similar. 1. First of all, soak the dried blueberries (80g) in water for 10 minutes. and turn on the oven to 150°C. 2. In a pan heat up the maple syrup (50g) and water (60g) and let them simmer for 5-7 minutes on medium heat. 3. Pour in the oats (110g), nuts (40g), seeds (30g+10g), coconut (30g) and drained blueberries (80g) and mix well together. 4. Add a tablespoon (10g) of blueberry powder (I use Frooggies, no affiliation) and combine. 5. Pour in the oil (25g) and mix well together. 6. Place some baking paper on your baking tray and pour everything on it, try to spread it out evenly. 7. Bake for 15 minutes, keep an eye on it, as not to burn it! 8. Let it cool down and then store in airtight jars. 9. Enjoy with yogurt, milk porridge or simply as it is! I love to use it also as a gift – it has always been very appreciated! First of all, soak the dried blueberries (80g) in water for 10 minutes. and turn on the oven to 150°C. In a pan heat up the maple syrup (50g) and water (60g) and let them simmer for 5-7 minutes on medium heat. Pour in the oats (110g), nuts (40g), seeds (30g+10g), coconut (30g) and drained blueberries (80g) and mix well together. Add a tablespoon (10g) of blueberry powder (I use Frooggies, no affiliation) and combine. Pour in the oil (25g) and mix well together. Place some baking paper on your baking tray and pour everything on it, try to spread it out evenly. Bake for 15 minutes, keep an eye on it, as not to burn it! Let it cool down and then store in airtight jars. Enjoy with yoghurt, milk porridge or simply as it is! 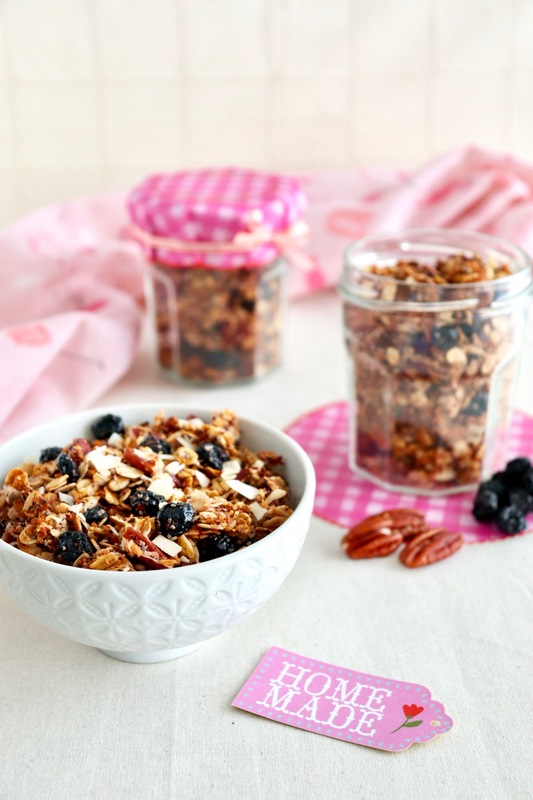 You can change all the ingredients to create your perfect granola! *affiliate link: this post contains affiliate links, meaning I recommend products I’ve used and may receive a commission if you purchase them too (at no additional cost to you).